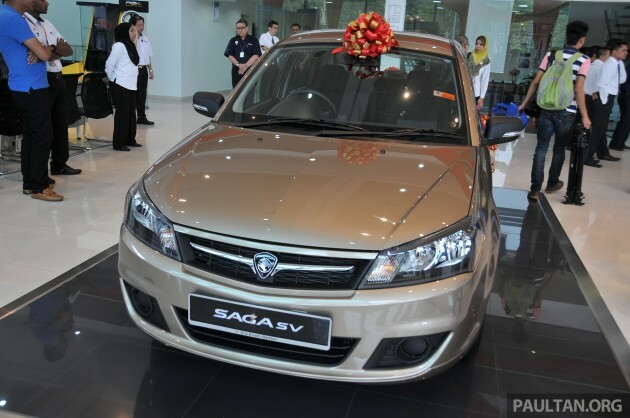 More than 6,000 bookings have been recorded for the Proton Saga SV within two weeks of its launch, according to a Bernama report. Although sales were slow in the run-up to the May general elections compared to last year, Hisham said the entry-level Saga variant would give the national carmaker a boost and help it achieve its goal of capturing a 30% share of the domestic market. Bernama reported in an earlier story that due to the demand, Proton may up production of the Saga SV from the current 2,000 units per month. “Currently, our production is enough to fulfil the number of bookings that we received, and we assure customers who make their bookings now that they can expect to get the car before Hari Raya,” Hisham said. He added that 65% of the total pre-orders (4,000 at time of reporting) were for the CVT-equipped version. We reported back in April that Proton Edar expects a 20% jump in total sales this year from the 141,000 units sold in 2012. Click here for full details and pictures of the Proton Saga SV. While most dream of the future, Jonathan Tan dreams of the past, although he's never been there. Fantasises much too often about cruising down Treacher Road (Jalan Sultan Ismail) in a Triumph Stag that actually works, and hopes this stint here will snap him back to present reality. Sell dis at 23K n u will get 20K bookings. … nonetheless, it still is safer than overpriced viva with 3-star rating. Sell 23k get 20k booking. And patrol station get 1mil income increase spare part shop get 1 mil increase also. Good good. Car for the masses.Basic transportation without the frills.Not everyone needs a fully kitted-out or filled to the brim cars.Most of the equipment installed are useless except concerning safety e.g ABS,EBD,Airbags,VSC and so on.Furthermore the kits doesn’t come cheap. In the end it’s all about choices.I wont condemn you on what car you choose.Its our right to choose anyway. if only we are given more choices within the same price range.. and not just 2-3 choices at best.. This should be how Proton should have sold their vehicles. A vehicle for mass market. Certainly worth every penny over other competitors in the similar price range. sure after 3 year all this junkyard will stay long in second hand shop with no buyers…till end no second hand buyer want to buy this junkyard expect sayur & baja seller…..
Really? You talk with full confident. Are you time traveler? pushing factor for others to sell cheaper cars !! So far so good. Good job and keep it up with new models and facelifted models. Reduce price by all means and capture the market , but Dont compromise on Safety features ! Pls. that’s exactly what they’re showing in this model. perhaps your message suits better the another brand. not surprise at all.. since when the Saga taxi uses 1.3..?? are u live under the rock for all these years..?? Don’t underestimate Taxi Saga FLX from Genting! They can overtake you up and down at genting! Blow you away! there’s a regulation in Malaysia that taxis have to be at least 1500 cc..
if it’s dont have a good resale value then let it be…coz it’s cheap already…of coz P2 have better re-sale value compare to P1…but we’re talking about ppl who have the capacity to own a better car at a cheap price at a right time..they never bother about next 3 years…u got ur money u shut up..at least they’re more jujur than P2…if they can share some parts contractor and based component soon, it’ll be god for them soon. P2 has a good reslae value than P1?? are u kidding me?? Perception drives it – people see what they want to see. it’s called top-down in psychology. Bottom line, don’t underestimate the power of perception. Halo…. 1.5cc what? Teksi kucing?? woww.. so full of confident..
and i guess this arie fella don’t even know what cc unit stands for..
Proton has proved that they can produce people’s car and still Jaguh Kampung. As for global market, Proton is still far behind other competitors in terms of quality and technology. Hidden due to lowcomment rating. Click here to see. Thanks for lighting up my day !! Jokes after jokes.. haha !!!!!! Hidup Hidup !!!!! Hidup Hidup !!!!! Production goes up, what about quality? Will it be sacrifice in order to meet the huge demand??? Congratulation Proton. Good Job!!! Keep it up. Proton has indeed able to staand alone now. So lets reduce the tax now. I want my BMW F30 at Rm120k. AirAsia – Now everyone can fly. Proton – Now everyone can drive. I suppose Proton should adapt the slogan above.. and hope to see other brands should follow suit to compete.. Enough of ripping Malaysians apart already..
My 1 1/2 year saga flx MT FC is RM50=260KM normal driving.1st and reverse gear hard to engage, complain to SC 1ST time not enough gear oil,2nd time change gear oil and still same.PROTON ENGINEER AND HEAD OF PROTON please explain why? THE MORE U SELL THE MORE THE BUYER SUFFER!so why sell many. why only domestic market? how long want to be champion in domestic market? go for global la…. They want domestic first,then ASEAN, then Asia, then global. P1 already surpass the target..please don’t compromise on the quality of your product P1. Look at the booking, amazing right. So, BN government, do consider take away all taxes on cars whether local made or fully import as it won’t going to kill local car manufacturers. By cutting all taxes, local cars will become cheaper & many people will aftortable to own at least one unit for their family rather than motorcycle. In terms of safety, I would says that cars are always better compared to motorcycles. Restructuring the overall cash flow, good cash management, do away all middleman transactions; open tender; eliminate all corruptions & etc, I’m pretty sure that the money save would able covers all taxes shortfall. No corruption means BN will die and your mother is still a virgin. very well said dude. I can’t stop laughing at the irony as I type this. Bila Proton sells Expensive car, bising menyalak2 tak puas hati mahal pulak. Proton sell more cars, petroleum company make more profit cause saga FC llike 1.8-2.0LITRE ENGINE? if u buy sure regret later. My oldest sister’s 2 year FLX and second sister’s 5 year BLM has never fail a bit. Truly a people’s car. good news woo…reduce some more price..even better…waiting for preve sv , exora sv with both car price less than 50k and it will also sell like char kuey tiaw panass woo…or.. roti canai…berbungkus-bungkus….or..buying toilet roll one trolley full..or..purchase as many cooking oil…many bagful of sugar..sapu habis. If excluse those taxi orders, how much actually individual sales booking??? Taxii is1.6litre engine with LPG tank. I own a saga flx MT my complain to proton is.high FC, gear hard to engage,engine sometime hard to start like no comprision,s,time nver even click. Complain to SC many times also same. It’s stress to drive this car.want to sell now price by rm5k. How? My nissan 130y about 30yrs can do better FC,with no feul injection,IAFM,direct ignition and dohc 16v. PROTON PLEASE WAKE UPPPPPPPP? ?PROTON SELL MORE SAGAS RAKYATS SUFFER MORE!SO WHY MORE? So many unfamiliar name here supporting proton..not sure they are really paultan’s readers or marketing guys from proton just want to boost the speculation…peace..
We bash and bash until they can come up with good car at good price so everyone can be happy. Don’t worry, bashers will not harm your pocket, you see why proton come up with Saga SV?? No?? I like the CVT gear box of FLX from punchpower train who I read supply to VW too and the manual from gatrag I read supply to BMW? Good price for Saga SV. View the car recently in miri, those car just arrive as sarawak will be late compare to KL. Since its shiped, so I wont bother. Overall the price is good for these variant. Quality I can see is average since the price match it. No matter how ppl complaint proton, I can see there are some improvement compare proton in 90’s. If ppl wish to buy better car compare to Proton they can choose as owner of Proton will not be having heavy monthly commitment. Service at showroom is not very good. There are 5 salesman but 4 did not stand up when I reach there for bout 15 minutes. They were sitting n talk around. There is one malay salesman serving a couple ask me bout my interest n he is very friendly. Proton should set up a team to train there salesline. This really uncomfortable when no one is bother me at showroom. Is like being insult. Hey, they did get salary n commission if customer buy car from them. Come on proton, local made must ensure good service to boost up sales. As we are local they should be proud if we buy Proton. This mean we are Malaysian. Wake up Proton for this matter. Haiya Bob, I see Preve everyday, many with KL plates all over Malaysia. My mum has one, and since then 4 of her colleges have bought one, while 4 also from my dad’s work place has bought one also. Preve is such a good car. yay.. more proton bashers to come!! reduce tax utk kereta import la,baru semua happy. Tak semua suka kereta model proton. yay.. in the near future we should have 6000+ more proton bashers!! hip hip hoo rayyy!!! Next Post: Mysterious car spied – is it a Ford Ka replacement?